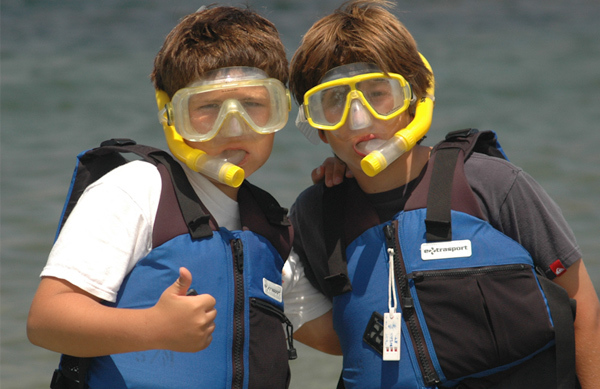 Mission Bay Aquatic Center Blog: Camp with a buddy is more fun! Camp with a buddy is more fun! There is a new feature that you may notice when signing up for camp this year. Campers who will be participating in the afternoon multi-sport camp and wish to be grouped together can now use the buddy request system to ensure that they get into the same group. If you know that you will be attending camp the same week as a friend, simply enter their name and email address at the buddy request page. They will then be sent an email announcing your request and will be provided a code to enter when registering, or a link to accept your request if they have already previously registered. Since the afternoon multi-sport camp is the only camp that separates into groups it is the only camp that needs to take advantage of the buddy request system. All other camps will be grouped by activity so if campers are signed up for the same activity they will already be in the same group. 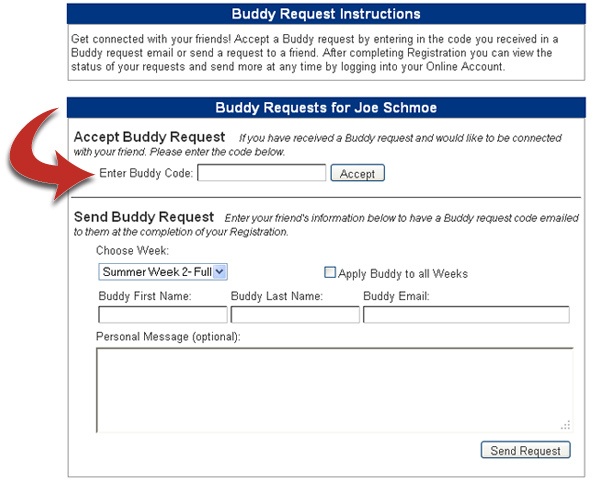 If you have any questions about the buddy request system, please feel free to give us a call at (858) 539-2003 or follow the instructions below. Remember that camp is more fun with a friend so take advantage of the buddy request system today! Enter your friend's name and email address in the buddy request window (pictured right). You can individually send requests for each week you are registering for. 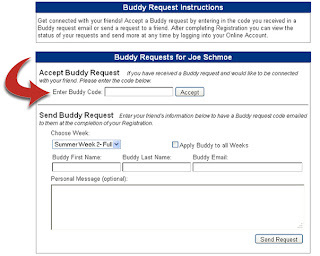 When you are registering enter the buddy request code in the box indicated below. 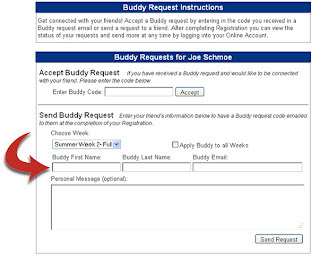 If you have already registered you can click the link in the buddy request email to automatically accept the request.